For some reason, 383 part D aired at about 10 minutes later than usual. Hence, the last 10 minutes is cutoff. On the bright side, the resulting sub was poor anyway as the person knew zero about baseball. Babe Ruth was called "Bay Bruce". I could excuse the mistake if not for the fact that a plaque with the proper spelling was right in front of his or her eyes. Suggesting to me, once again, that they have nothing but a paper script to go by. Seems like these subs are just an afterthought, and the decision makers don't really give a crap. Same old; same old for 384-387. Man, I am way behind. Sorry about that. From 388 & 389 are okay. 390 & 391 passable. 392 has the usual spelling glitches. 393 had one bad translation of the time. Can you get me a TS of 394's opening when you get there? Or really, any episode with that opening? I will take a look. For 394-396, the most obvious error was when the translator used the word "closet" instead of "closest". When watching this version of 397, nobody is going to understand the sweet & salty reference made at the end of the episode. Whoever translated the intro sequence for 394 doesn't know what English is, lmao. Four lines in a row, all of them have something wrong with it. "Stars are for some reason are attractive"
"They can be the culprit or an actor (star)"
"The Youth Detective Squad goes through great adventure"
"At an eccentric mansion of tricks! Off we go after the treasure!" 1) Double 'are' in the first line. 3) Missing the article, should be 'goes through a great adventure'. 4) This is the continuation of the previous sentence, so it should start with a lowercase letter. Bonus) First two lines are also missing punctuation. I still like Puto's rendering, "There's something fascinating about stars, be they culprits or actors." Basically what happened is my main computer was unbootable for multiple months. I actually thought I would be down for a week or two at the most. Every attempted fix caused more problems as I could not figure out if it was a hardware or software issue. So I stopped trying until I could figure out exactly the cause. Luckily, something I did was right and my system finally booted. But by then, I was way behind. Then, a family issue came up in the last month that put a delay on things. Hopefully now, I will be able to post in this thread regularly again. However for the time being, I will probably only watch and comment on the significant episodes until I reach the current airings. What episode is the channel on right now? 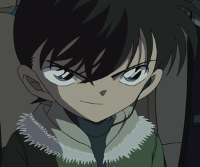 The way they handled Heiji's "kudoi" in 406 would work really well for a dub, not so much a sub. They rewrote the joke to use the word "judo" instead. This weekend's airing should be 451 and 452. Image is from the 425 case. These are their names. Hm. That's a first - "view raw image" redirected me to an ad the first time.